WHAT'S wrong with these graphics? Well, they are contrasting forecasts as to the path that Typhoon 'Mina' (international name: Mitag) is supposed to take as it passes through the Philippines. Incidentally, they are what City Assessor Mon Albeus showed me this afternoon as we were lining to punch our timecards at the City Hall lobby. The one on top came from the Philippine Atmospheric, Geophysical and Astronomical Services Administration (PAGASA), the state weather forecasting agency. The one below came from Typhoon2000.com, a tropical cyclone tracking website -- the country's first, according to its tagline -- being maintained by Michael David "Mike" Padua, a Naga-based enthusiast who had been tracking storms since I can remember. With Supertyphoon Reming's terrible force still fresh in our minds, we sighed with a measure of relief after waking up early in the morning to find that Mina's projected path has inched up upwards. Two days ago, the initial projection is that it will largely take the same destructive path that Reming took last November. The PAGASA forecast -- which came out late in the afternoon -- was a downer and cast a pall of gloom. It has not veered from the projected track two days back. That it was broadcast over the 6:30 pm primetime news by the two leading TV channels surely kicked up our people's worries several notches higher. Locally, Mike has become the favorite whipping boy of several radio broadcasters with a political agenda who can't reconcile themselves with the fact that in this age of the internet, weather forecasting -- albeit unofficially -- is no longer the exclusive domain of central state agencies like the PAGASA. Now, which one do we believe? Mon asked me. That, I think, is the uneasy dilemma facing most city residents today as we prepare for Typhoon Mina. I said I will stick to Mike's projection. Somebody from the City ENRO agreed, saying other meteorological websites linked to by Typhoon2000 carried largely the same path. Just to show you, I also uploaded here the forecasts of the Honolulu-based Joint Typhoon Warning Center (JTWC), the Japan Meteorological Agency (JMA), and the University College of London-based Tropical Storm Risk (TSR), in that order. But then again, the best position should be to prepare for the worst. Which, incidentally, was the message emphasized by Vice Mayor Gabby Bordado when he presided over a meeting of the City Disaster Council just before lunchtime. Tomorrow morning, Mayor Robredo will preside over an emergency meeting of the city government Management Committee (ManCom) to finetune local preparations before Mina will start lashing Naga beginning Friday midnight. Apparently, different meteorological stations/ weather report outfits have their own versions of tracking a typhoon. What does it tell us ? 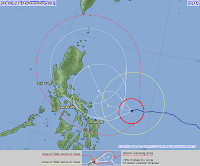 That weather forecasting/typhoon tracking isn't really an exact science, it's all tentative. Still, it's prudent to take all the necessary precautions. Better safe,than sorry. I think this has happened before in 2004 or 2005. PAGASA got it wrong that time. The PAGASA forecast -- which came out late in the afternoon -- was a downer and cast a pall of gloom. It has not veered from the projected track two days back. I think, is the uneasy dilemma facing most city residents today as we prepare for Typhoon Mina. The PAGASA forecast - which came out late in the afternoon - was a downer and cast a pall of gloom. It has not veered from the projected track two days back. Mayor Robredo will preside over an emergency meeting of the city government Management Committee (ManCom) to finetune local preparations before Mina will start lashing Naga beginning Friday midnight.